For a burst of sunshine energy, add a teaspoon of Health Elements Spirulina to your breakfast smoothie, protein shake or stir into apple juice. To optimise: 3 grams 3 times daily. Best taken after meals with at least 1 cup fluid (juice tastes best). To curb appetite for natural weight control, consume 15-30 minutes before meals. Contra-indications: Spirulina contains iodine. If you have thyroid problems this product may not be suitable for you - please seek medical advice. Scientists have discovered that similar to the energy from the sun, fresh Spirulina is a powerhouse that stores and converts enormous quantities of solar power into precious nutrients. Green chlorophyll, blue phycocyanin and orange carotenoids, the natural pigments that give Spirulina its deep green colour, collect the sun's solar energy, giving us extra vitality and optimum health. Spirulina is the botanical name of a blue-green algae that is barely half a millimeter long. 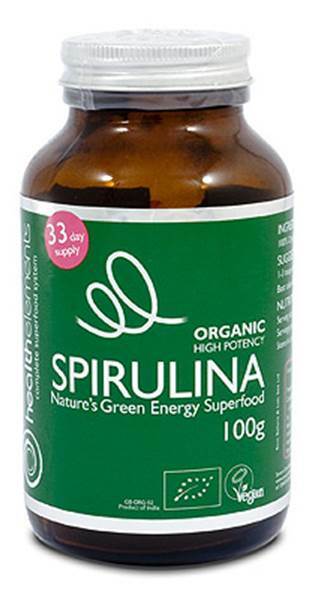 In Latin the word Spirulina means little spiral, referring to the algaes spiral structure. Often referred to as the world's most nutritious natural superfood, Spirulina contains the most remarkable concentration of nutrients known in any food, plant, grain or herb. It's the highest protein food - over 60% all digestible vegetable protein. It has the highest concentration of beta carotene, vitamin B12, iron and trace minerals and the rare essential fatty acid GLA. Scientists have discovered that energy from the sun is extremely important for our health and is found mainly in fresh vegetables and sun-ripened fruit. Fresh Spirulina is a powerhouse that stores and converts enormous quantities of solar power into precious vitamins, minerals and energy. Athletes - to improve performance, stamina and endurance and boost their high energy lifestyle. For the bodybuilder, Spirulina's most significant attribute is its high 65% easy to digest protein content. Seniors for better digestion, increasing good health in the colon and relieving symptoms of constipation. As a high nutrient and easily digested food, Spirulina also has a beneficial effect on malabsorption, a common problem for seniors. Pregnant and nursing mothers providing extra protein and iron, without the additional fats and carbohydrates. Those following a weight loss plan to support a healthy balanced diet, Spirulina is a highly concentrated natural food that helps to restore natural body weight by satisfying the body's real hunger for nutrition. Cultivated in South India in Oonaiyur - where the temperature is extremely conducive for growth of quality, high potency Spirulina. Across the one hundred and twenty acres of land in a remote hamlet, there is no ground water contamination. Free from pesticides, herbicides and artificial fertilisers - where cultivation is controlled for purity and potency. High levels of Phycocyanin - ranging between 12-15%, gives Spirulina its unique blue colour. Mild in taste and has better odour - as a result of special cultivation and processing methods. Rich in pigments and with high mineral levels - a sign of quality Spirulina. Analysed in various International laboratories - to ensure quality and potency parameters. Gelatine free. 100% Certified Organic - by institute of Markokoloie (IMO), Switzerland as per USDA NOP. Currently working towards UK organic certification.